Cell phone needs a charge? Take a walk in the sun with this bag, and you're goldenand green. 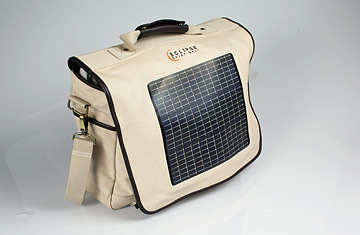 The solar panel in the Eclipse Fusion laptop bag (above, $200) is connected to the receiving end of a 12-volt cigarette-lighter adapter; you'll need the CLA plug that's compatible with your device to make it work. The Solio Hybrid 1000 portable panel ($80) also charges on the go, as does the HYmini ($80), which looks like a fan but captures and stores wind energy for two weeks.